The Rexel ProStyle 2102563 is a paper shredder for use in an home office. In larger offices it makes a useful personal, under-desk shredder. At a pinch it can also be used as a shared office resource. The ProStyle 2102563 is a “pull out” paper shredder design. The waste basket has a viewing port. When full you simply pull out the waste basket like a drawer. This makes for less mess than a conventional “lift off” design. Ideal for busy office use. The ProStyle is a cross-cut shredder able to chomp through up to 12 sheets of A4 in one pass. It’s a quick, convenient way to destroy unwanted private papers or confidential financial documents. Secure destruction with a ProStyle 2102563 protects privacy and eliminates personal data from the clutches of identity thieves and fraudsters. This particular Rexel ProStyle model first cuts paper into very thin strips, it then cross-cuts the strips into tiny rectangles 4x45mm in dimension. It has a security or DIN rating of DIN 3. This means the paper chaff produced is completely unreadable. Rexel ProStyle 2102563- What’s in the Box? The Rexel ProStyle 2102563 is a classy pull-out waste basket model. The cutter head operation buttons are positioned on the edge of the case and the paper throat is wide. You can place this paper shredder beside or under a desk with ease. Shreds aren’t deposited evenly. They can build up away from the waste bin viewing port and block the shredder, which appears empty to the casual viewer. Regular emptying is recommended. At Best Buys Compared we make use of owner experiences to find the best products in a category. We then track prices at a panel of trusted UK retailers so you can enjoy the best cheap paper shredders. A cross cut paper shredder is the ideal tool in the constant battle to preserve privacy from the assault of identity thieves and fraudsters. Use a micro-cut shredder and you can securely destroy private papers, confidential documents and sensitive financial statements. 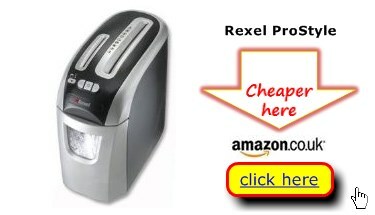 Best Buys for is a consumer resource offering user-supplied reviews, insights and price comparison details on the best paper shredders for the home office use like the Rexel ProStyle 2102563.